WoSign ranks No.1 in the 2016 Netcraft market report on Chinese SSL certificate-WoSign SSL Certificates! In the newest Netcraft statistic report of Chinese SSL certificate market, known domestic CA, WoSign, has come in the first place. Netcraft is an internationally-recognized internet research institute, whose objective, rigorous analysis and studies of SSL certificate market are most influential in the world. 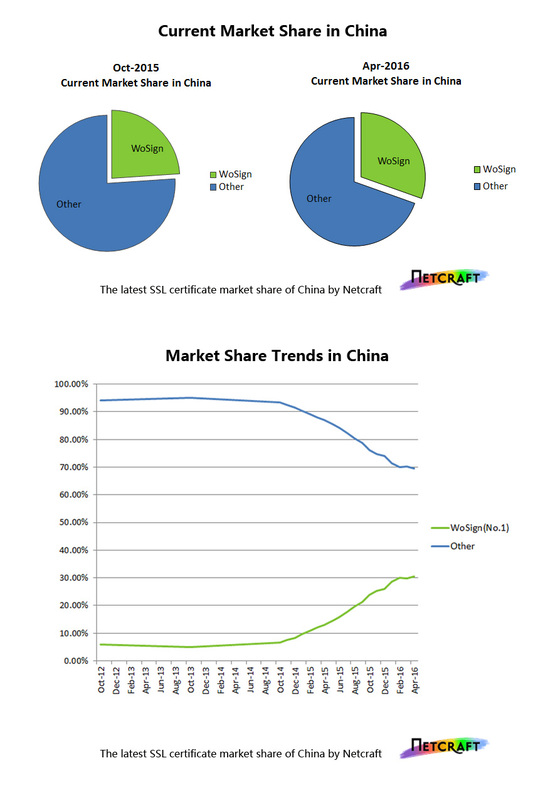 According to the Netcraft report, the rapid growth of WoSign (www.wosign.com ) in Chinese SSL certificate market makes it come to the first place in market share within a year, catching up with and surpassing many foreign enterprises. WoSign has become the Chinese brand with the strongest competitive power in the field of SSL certificate.Chinese SSL certificate market is based on SSL sites which are hosted in China. CEO of WoSign, Mr. Wang Gaohua, said that the establishment of an independent, globally-trusted certificate authority with license of the Ministry of Industry and Information Technology cannot be done overnight. It takes years of accumulation and growth. WoSign has been making enormous efforts in the field of digital certificate for over a decade, building independent technology system and improving technical strength. We have successfully passed the strict WebTrust international certification, gained the electronic certification service license of the Ministry of Industry and Information Technology, recognized by Google Chrome, Mozilla, Microsoft and Adobe, became the first Chinese member of CA browser industry alliance. Advanced technology ensures the compatibility of the product and makes it possible for WoSign certificate products to replace foreign digital certificates. Impeccable service system, on the other hand, is the key factor of wining recognition of customers and public reputation. WoSign owns a professional team of customer service and technical support. All team members have been through tough training and examination. They are able to provide one-to-one professional service and technical guide for customers. Furthermore, aiming at providing the world-class customer service, WoSign has made the service demand of 7x24 hours service and the response time of ten minutes so that we can solve problems for customers even during holiday or in late night. The improved service system has won the recognition of all customers. At present, there are more than 180 countries and regions choosing WoSign SSL certificate service. Many well-known electronic companies and government departments have gradually replaced with WoSign SSL certificate, breaking the monopoly of foreign CA in Chinese SSL certificate market. WoSign CA Limited is the largest Chinese independent certificate authority, devoting into the application of PKI technology and the popularizing of server SSL certificate. WoSign SSL certificate is the only domestic one that has met the international standards and supports Chinese language. The international internet security environment is getting increasingly serious. We have a long way to go to protect internet security. Ranking in the first place of Chinese SSL certificate market is only a beginning. WoSign CA will proceed and take the responsibility of infrastructure of internet security and help build a securer and more trustful internet environment.